Pasture-raised v. Free-range Chickens | Our Farm by Earth Flora Inc.
NO they are not. Here’s why. However, the USDA does not require the hens to be actually going outside (only access is required), nor does it define what outside is. They also do not have any requirement on the size or type of the outdoor space. “Free range” can actually include a chicken coop with a small door that leads to just a small outdoor pen, or a patch of dirt or concrete (even without grass.) In fact, Michael Pollan, in Omnivore’s Dilemma, describes a free-range CAFO as thousands of birds packed into windowless, military barrack like buildings with one or two small doors to a 10×10 outdoor pen. He also doubted any of the chickens actually ventured out for fear of the unknown. The hens may spend their lives inside the pens, not have enough sunlight or breath natural air. Additionally, free-range poultry are usually fed grains, which are not the natural food of hens/chickens. 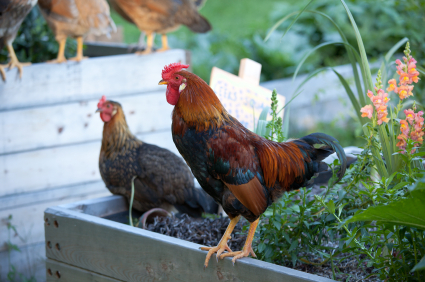 Hens/chickens are omnivores, and naturally eat seeds, insects, and grubs. They can also consume small lizards, mice, and frogs. Healthy eggs and meat come from poultry that were able to eat green plants, seeds and bugs, and exposed to sunlight. Thus, if you buy “free-range” make sure your farmer or supplier does it the true “pastured” free range way. That is, the hens/chickens have actual time outside eating grass and grubs, and exposed to sunlight and fresh air. The best ones we have found are those hens that are housed in mobile structures so you can move the houses around and give the hens constant and easy access to vegetable and bugs. Pasture raised poultry mean the hens/chickens actually stay outside. They are able to eat bugs and vegetation. These hens/chickens eat seeds, green plants, insects, and worms. The chickens and eggs laid tend to be more nutritious because these chickens have exposure to sunlight, which their bodies convert to Vitamin D, and pass it on to their eggs. Eggs from pastured-hens have three to six times more vitamin D than eggs from hens raised in confinement. DowntoEarth poultry and eggs are native and pasture-raised. The reason why we choose native chicken and eggs is because the native breed cannot be confined. By nature, they cannot be placed inside cages as they are wild animals. They also cannot be kept together in enclosed quarters, as they fight other chickens/hens and have a tendency to fly. These chickens/hens have to be placed outdoors, given full access to vegetable and grubs, and be under sunshine. 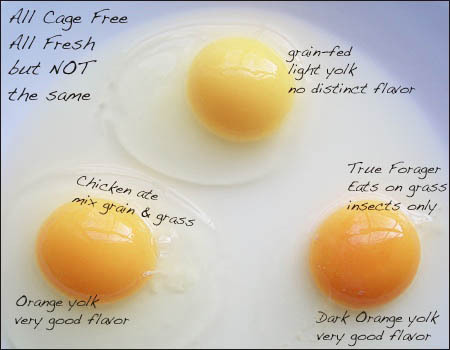 We have made several comparisons of native v. free-range v. commercial eggs and have seen a big difference in taste, color and consistency.